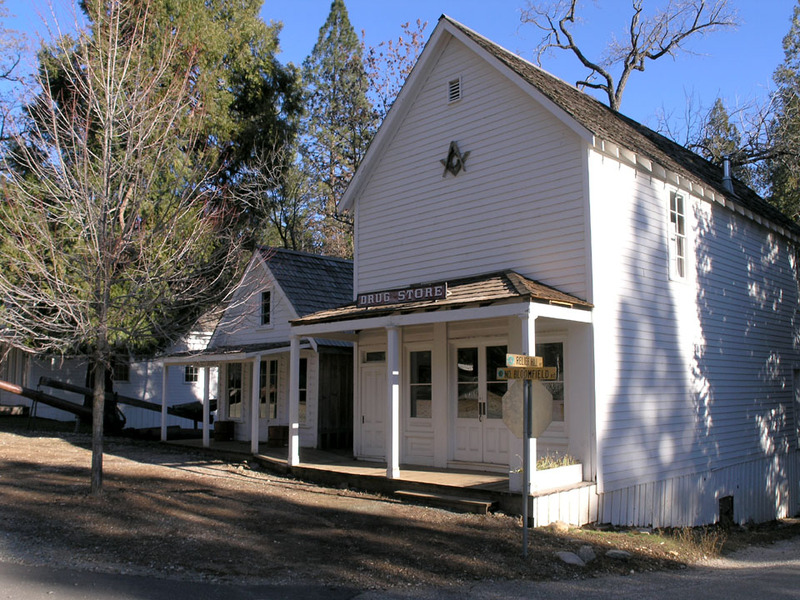 One of the delights of living in the Northern Mines area of California is that history just oozes from everywhere. No where is this more apparent than the old hydraulic mines of Malakoff Diggins. Close by and closely related to the diggins is the preserved town of North Bloomfield. No matter how you may feel about the mining industry generally, the remains of the Malakoff Mine (North Bloomfield Gravel Mining Company) are a photographer’s delight, especially in the early morning or late afternoon when the play of light upon the golden cliffs is at its best. The process of retrieving the gold from the ancient riverbeds was to blast them with high-pressure hoses. The gold was then separated from the gravels and silt by conventional means. The problem was what to do with the residue and for that the miners dug a tunnel to allow the debris into the river system. It was a disaster! 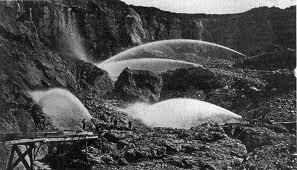 The silt from hundreds of such mines washed down into the Sacramento Valley where it destroyed agriculture and raised some river levels dramatically. Eventually in 1884, a lawsuit from the farmers resulted in the Sawyer decision which sought to stop the process. There was a loophole however: hydraulic mining could continue if the silt was not allowed to enter the watershed. To this end the Malakoff Mine and some other ran the silt into cachement basins. This was an expensive process. The mine operated into the early 1900’s when the cost of keeping up with lawsuits and regulations eventually outweighed the profits and the mine closed down. The companion town of North Bloomfield, originally named “Humbug”, is nearby. It is well-preserved and part of the State Park system. At one time about 1700 miners and their families lived here. One family still does. Campgrounds are in the park or you may reserve a restored “miner’s cabin” for minimal cost. When rangers are on duty, tours of some of the old buildings may be arranged. A giant water monitor (water gun) is sometimes demonstrated. Warning – These places could be in danger of being shut down! These wonderful resources are in trouble of being closed down due the Governor’s plan to eliminate a number of state parks, including Malakoff Diggins. 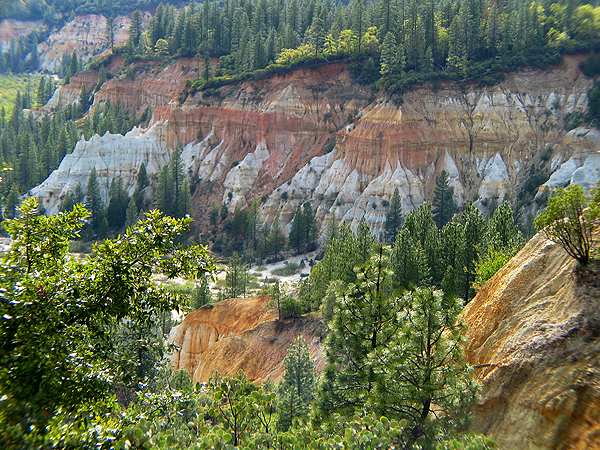 The park is about twenty five miles from Nevada City (fifty miles NE of Sacramento CA). Many recommend the paved road route which consists of Hwy. 49 north from Nevada City to Tyler-Foote Road then east to the park. I prefer the North Bloomfield Road out of Nevada City. It is dirt part of the way but nothing any car couldn’t easily negotiate. It crosses the South Fork of the Yuba River on a picturesque bridge called Edwards Crossing. There are many sites about this area. I like this one from Malakoff.com. Wikipedia does a credible job on the subject too. The South Yuba River State Park begins at Malakoff and ends twenty miles downstream at Bridgeport, but it is also on the hit list for closure. This entry was posted in Sierra Nevada History. Bookmark the permalink.